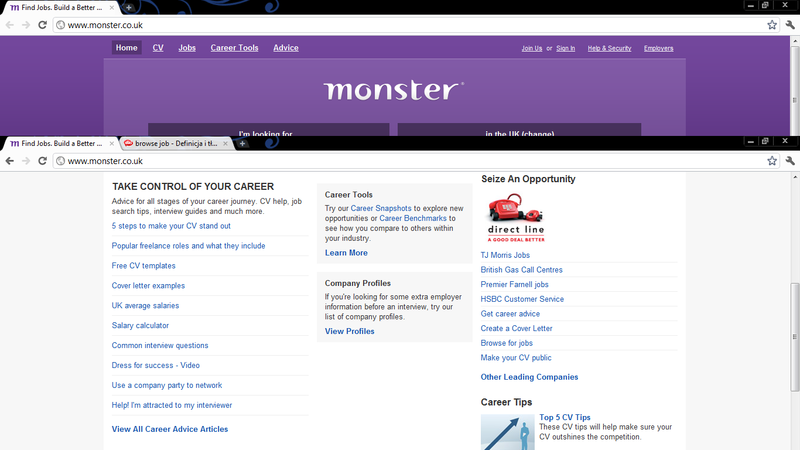 The on-line recruitment site I have chosen is www.monster.co.uk. It is really user friendly and accessible site, with a clear layout even for those who have never used this kind of website before. 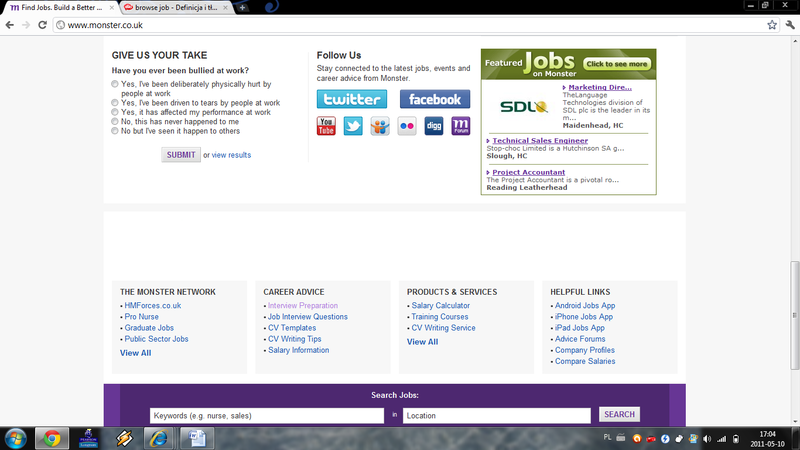 Monster site offers personal insight into jobs we are interested in. 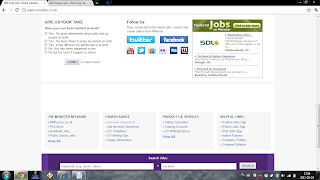 The layout allows searching for the job by specialising the industry and specific job role they are looking for. It is really helpful option due to the fact we are targeted at the desire post. 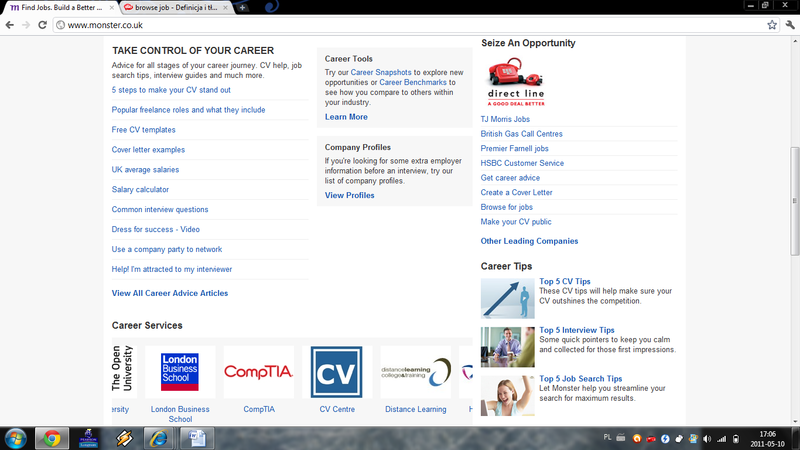 Job Search where we can specify in detail desire by typing Location, Company, Industry, Category (e.g. Accounting/Finance), Job Type, Career Level and Education Level. Next it is showing a list of jobs for seeking area. We can also stay connected to the latest jobs, events and career advice from Monster by adding this page to favourites on for example on Facebook or Twitter. 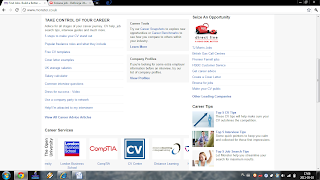 Not only is it a page to look for some jobs but also the forum where people can discuss job issues. Monster site contains also big variety of articles on the such topic as Career Development, Job Interview or Workforce. Merseyside Fire Service’s recruitment campaign is the one which has recently interested me. Merseyside Fire Service is the statutory fire and rescue service covering the county of Merseyside in north-west England and is the statutory fire fighting and rescue service responsible for all 999 fire brigade calls in Sefton, Knowsley, St. Helens, Liverpool and Wirral. They were trying to recruit more ethnic minority and female fire-fighters. To achieve the goal Merseyside inter alia hold awareness days to give people an idea of the entry standards needed. They also advertised vacancies through agencies who specialise in attracting women and ethnic minorities. Their performance turned out to be successful due to the fact they noticed 100% increase in workforce representation of both groups. Moreover, three females and six from minority groups initially started job. I feel that this recruitment campaign caught my interest because the stereotype for a fire fighter is a man and organisation was predominantly aiming at women and ethnic minority. Secondly I liked also the fact that Merseyside is one of the few organisations drawing attention to the issue of equal opportunities and diversity management at work. To conclude recruitment is known as all activities directed towards locating potential employees. Employers by recruitment want to obtain a pool of suitable candidates for the post. As a process it is a major cost for the organisations but they have to take part in it to be seen as using fair procedure. http://www.merseyfire.gov.uk/aspx/pages/careers/recruit-charter.aspx [Accessed 1 May 2011]. www.monster.co.uk [Accessed 1 May 2011]. http://3.bp.blogspot.com/_6rtruk5vsGk/TH2mrUL6EoI/AAAAAAAAAC0/HSBYClqIMQU/s1600/Woman+Firefighter.jpg [Accessed 1 May 2011].